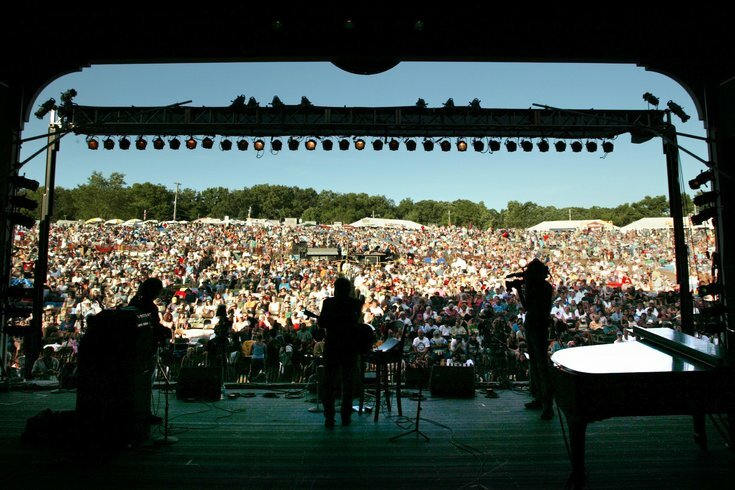 The Philadelphia Folk Festival is the longest continuous running event of its kind. Philly's annual Folk Festival is back again for its 57th year, so we put together an all-inclusive, whatever-you-might-need, 4-1-1 for you all you folk-lovin' folk. The fest is the longest continuously held outdoor music festival in the country and the parent organizer, the Philadelphia Folksong Society, is said to hold a fifth of all of Philly's musical history, according to WXPN. The camp-inclusive festival has hosted some big acts and always brings more than just music — there are vendors, craftsmen, and tasty food, too. It all goes down in Upper Salford Township near Schwenksville, so if you didn't know that, you might want to look into how you're getting there. It's actually 35 miles away, or about an hour-and-a-half outside the city. It starts Thursday night for campers only, but then everything kicks off Friday morning at 10 a.m. The festival always brings in some bigger names. This year, some notables are Wynonna Judd and her band The Big Noise, actor turned side-gig musician Jeff Daniels, legendary singer-songwriter Patty Griffin, the folksy-slash-bluesy-slash-jazzy David Myles, and the NPR-lauded Valerie June. You can check all of the 100-plus artists here. A full schedule of where to see them and what time they go on is available right here. Oh, and here you can download a PDF version for mobile if you don't have any internet service while you're there. You're welcome. Surprisingly enough, there are still tickets available. And you can even still reserve a spot to camp. General admission tickets for the entire weekend are $195 and $250 for general admission, plus camping. If you just want to go for a day, Friday tickets are a more-affordable, at $65. Saturday tickets are $80 and Sunday tickets are $65. And tickets for general admission and camping for kids under 18 are a bit cheaper, if you want to make it a family affair. You can purchase tickets here through the end of the weekend. A new rule this year is that all generators (RV and portable units only, no generators are allowed for tent camping) must have an approved “exhaust flow pipe” attached to generator exhausts to vent the fumes upward and away from campers. This is basically so you don't shoot your fumes into someone else's campsite. If you don't have the right equipment, festival management recommends you purchase something like this. Another note on generators: management asks that you only run the generators from 9 a.m. to 9 p.m. and make sure you bring a sound shield so that it's not too noisy. Oh, and no fires, folks. Here are some more rules you should read before you go. It appears on-site guaranteed passes have all sold out, which were going for an extra $25. There are more free parking spaces in satellite parking areas that will transport you to the festival via shuttle bus, but you're not guaranteed a spot. If you need transportation getting around the festival, you can still purchase a TramCart Ticket, which is a golf cart that will take you wherever you need to go all weekend. There will be pre-set stops for the cart from camping areas to inside the festival. Festival management is recommending you download the Philadelphia Folksong Society app, where you can purchase tickets or add-ons, see a map of the festival site, and find your friends and performers with the "Where the folk are we?" feature.